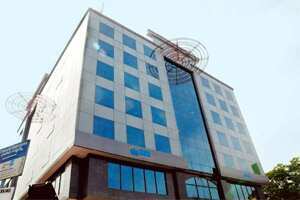 No.2: A file photo of the SKS Microfinance building in Hyderabad. Photo by Bharath Sai/Mint. Mumbai:SKS Microfinance Ltd, India’s lone listed microlender, has lost its position as the largest Indian microfinance institution (MFI) by loans to Kolkata-based Bandhan Financial Services Pvt. Ltd.
SKS’ total loan book stood at Rs2,635 crore in September. In comparison, Bandhan has given loans worth Rs2,713 crore. Dilli Raj, chief financial officer of SKS, downplayed the decline in its loan book, saying it is no longer a numbers game. “If you take into account the portfolio, which we have written off, technically our financial assets are Rs3,189 crore," Raj said. “It is no longer a numbers game. The quality, governance and client protection are decisive factors from now on." Experts do not buy this argument. They say lenders do not consider written-off loans a part of the loan book, nor the securitized assets. Chandra Shekhar Ghosh, chairman and managing director of Bandhan, said the firm expects its loan book to grow 22-25% in the year to March 2012. The company is also preparing to apply for a banking license as and when the Reserve Bank of India (RBI) finalizes guidelines for the entry of new banks, he said. Bandhan has a customer base of 3.2 million and a net worth of Rs606 crore. Its investors include Small Industries Development Bank of India (Sidbi) and International Finance Corporation. This is possibly for the first time since it was incorporated as a non-banking finance company (NBFC) in 2005 that SKS is losing pole position as the largest Indian microlender, affected by a controversial state law in India’s fifth largest state Andhra Pradesh—also home to SKS—in October 2010. Andhra Pradesh, which accounts for a quarter of India’s Rs20,000 crore microlending industry, enacted the law in the wake of a series of suicides due to alleged coercive recovery practices of some MFIs. MFIs collection rates fell to 5-10% as a result in Andhra Pradesh and they stopped giving fresh loans to borrowers. Banks stopped lending to the sector. MFIs give tiny loans to poor borrowers at a 24-36% rate of interest and source money from banks to do business. SKS has seen a drastic 34% decline in its net worth since March because it wrote off loans given to Andhra Pradesh borrowers. Its net worth slipped to Rs1,181 crore in September from Rs1,780.82 crore in March. Total provisions and write-offs of SKS rose 21 times to Rs353.34 crore in the September quarter from Rs17.3 crore in the same quarter last year. SKS, founded by Vikram Akula as a non-profit organization in 1997, converted itself as an NBFC in 2005. Its investors include Sequoia Capital, Sandstone Capital Llc, Kismet Capital Llc and Sidbi. The company was in the news in October last year for sacking its then chief executive officer, Suresh Gurumani. SKS entered the capital market with an initial public offer in August 2010. Investors have lost around 82% of the value of their shares till date. On Wednesday, shares of SKS dropped 8.64% in the Bombay Stock Exchange to close at Rs175.55. Industry leaders are not surprised with SKS losing its top slot. “It was definitely bound to happen given the crisis in the Andhra Pradesh microlending industry," said Kishore Kumar Puli, head of the Andhra chapter of Microfinance Institutions Network, an industry lobby, and head of Trident Microfin Pvt. Ltd.
Mathew Titus, executive director at Sa-dhan, another association of MFIs, said microlenders should now pay more attention to clients. Banks, too, should take into account these factors while lending to these MFIs, Titus said. “Non-Andhra Pradesh MFIs will definitely get more attention from now on," Titus said. “My sense is that while Andhra Pradesh MFIs were previously getting 55% of total loan disbursements by banks, you will see that dropping by at least 10% going ahead." SKS had posted a loss of Rs384.54 crore in the three months ended 30 September compared with a loss of Rs218.74 crore in the preceding quarter and Rs80.54 crore net profit in the year-ago period. Total income declined to Rs123 crore in the September quarter from Rs367 crore a year earlier. “A lack of availability of adequate funds will slow down the growth further for Andhra Pradesh-based MFIs compared with those outside the state," said Ravikumar Dasari, manager, NBFC division at CARE Ltd. “The biggest challenge for SKS in the near future is to successfully complete the announced Rs900 core qualified institutional placement," Dasari said. The crisis in the microlending sector had prompted RBI to issue regulations early this year to govern MFIs operating as NBFCs. This was based on the recommendations of an expert panel headed by Y.H. Malegam. The new rules capped the interest rate MFIs can charge at 26% and made a minimum two-year tenure mandatory for all loans above Rs15,000. In July, the government had placed a draft microfinance Bill that sought to put MFIs outside the purview of state-level legislation by stating that those MFIs registered with RBI won’t be treated as moneylenders. Parliament is expected to discuss the Bill in its winter session.